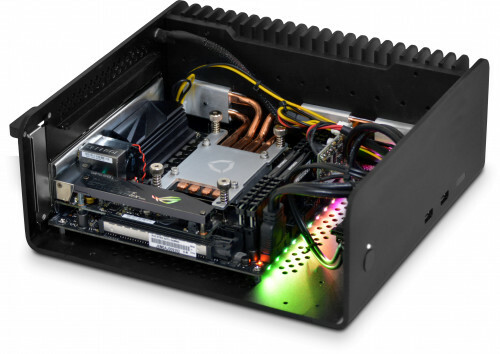 This high-specification compact fanless PC comes fully-built and ready to go. It has no fans for zero noise, zero dust and zero maintenance. It can be used as a general purpose machine or a dedicated media PC using Windows Media Center. 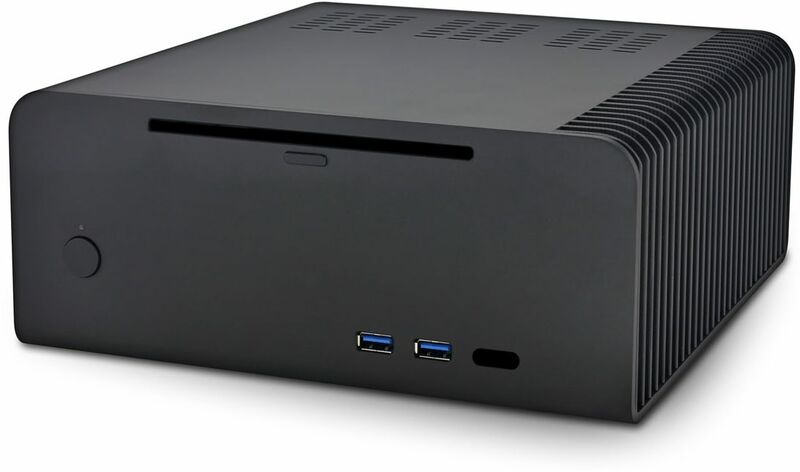 The Sentinel Fanless PC offers great performance, low power consumption and absolutely silent running. Only 110mm high and 250mm wide, it is functional, attractive and unintrusive. The machine is supplied in a shot-blasted finish and its fascia is clean, elegant and uncluttered. The PC itself doesn't compromise on performance, and can be built pre-installed with up to 16 gigabytes of memory. Although Microsoft Windows will run happily on 2GB of memory, we recommend a minimum of 4GB to ensure that the machine has plenty to spare and will always offer excellent responsiveness whilst running PVR software such as Media Center which comes with Windows 7 and Windows 8. Despite its diminutive size, it packs a real punch - Intel's Ivy Bridge processors give fantastic performance and low power consumption, allowing the machine to be cooled without any forced air whatsoever. The whole case acts as a processor heatsink, with heat being efficiently transferred from the CPU to the chassis via four copper heatpipes. Here at Quiet PC we believe that customers have every right to expect the best possible performance from a brand new PC, so every system we build comes with our Clean Build™ promise. We install the operating system (if you order one), motherboard drivers, OS updates and (for Windows 7 only) Microsoft Security Essentials / Windows Defender - that's it. You won't be pestered by pop-ups and nag screens and you can get on with using your new PC immediately without having to uninstall lots of junkware first. Your new machine will boot in super-quick time and will stay running quickly for many months and years to come. Our warranty runs for two years and is "collect and return" meaning that you don't need to worry about getting the machine back to us - we will instruct our courier to collect it from you on a day of your choosing, then after we have checked and repaired it we will send it back to you by express courier at our expense. In addition, unlike many other PC suppliers, we have an "open-case" policy which means you are free to open the machine and perform your own minor modifications or upgrades without worrying that your warranty might be affected. All versions of Windows 7 include Windows Media Center which is a great way to watch and record terrestrial and/or satellite TV (in conjunction with a TV tuner card), as well as watching films, viewing photos and listening to music. Windows 8.1 and 10 do not include Media Center, although it can be added to Windows 8.1 Pro only for a nominal charge by requesting a product key on the Microsoft website. Adding Media Center to Windows 8.1 Pro also gives you the ability to play DVD films. We recommend Windows 8.1 Pro for Media Center use rather than Windows 7 because it has more features, faster performance and will be better future-proofed. Please note: The Media Center key mentioned earlier is only compatible with Pro version of Windows 8.1. PLEASE NOTE: As already stated Windows Media Center is not available with Windows 8.1 (non-Pro version) and Windows 10. There are other programs available that offer similar features to Microsoft's Windows Media Center. The most popular are MediaPortal and Kodi (formally known as XBMC). Both programs offer the facility to do exactly (and much more) what Windows Media Center does, although some configuration is required via plugins (add-ons) supplied by both MediaPortal and Kodi. Both pieces of software are open source which means they are free for personal use and they can be used with any Windows operating system, including Windows 8.1 (non-Pro version) and Windows 10. We highly recommend you take a look at them to see if they are more suited to your needs. I have always wanted to have a PC that was powerful enough for my needs with the ability to run silently, and thankfully with this system, that time has come. From the original configuration, I have since added a 750GB Samsung SSD and upgraded the RAM to 16GB. Both tasks were very easy to complete. I currently have it hooked up to 2 x 2K Dell monitors through the HDMI connections and it runs them perfectly in full resolution at 60hz. I have had this PC now coming up to 3 years and overall I have been very happy with it. If I ever need to upgrade to something newer I will definitely buy again from Quiet PC. Got a unit with a i7 4790T (45W TDP), 16GB of RAM and a 850 PRO. Standard W8.1 installation went almost flawlessly with all drivers being correctly installed (except the sound driver which was however just a few clicks away on the internet). Boasts an impressive performance, without the slightest noise. Just stays there without even noticing it’s turned on. That's the way I expect computers to function. CPU temperature stays at about 40C for usual tasks, about 50C for more intensive tasks. In addition to being totally silent, stylish and compact this unit can also cope with some moderate number crunching: H.264 encoding with HandBrake is pushing the temperature to 68C after 20 minutes and Prime95 torture test is pushing the temperature to 72C after 20 minutes (max stated operating temperature for the i7 4790T is 71C). Difficult to find small PC with high-spec options. Case solid and copes well with Core i7 4770T 45W. No bloatware. All drivers. Quiet. Makes me smile!